If water, sewage, gas and oil can be transported through underground pipelines, why not consumer goods as well? Some Western European countries are getting serious about transporting consumer goods through automated subterranean networks – introducing a fifth transport mode next to road, rail, air and water. This rare combination of low-tech sense and high-tech knowledge could lead to a further economic growth without destroying the environment and the quality of life. Super fast underground cargo transport is a favourite subject of futurologists. Yet, the key to the feasibility of the proposed systems is their very low but constant speed. "You could order something on the internet and pick it up in your cellar the next morning"
Sending cargo goods through underground pipelines is anything but new. As early as the second half of the 19th century, systems for the transport of mail and small packages became quite common in most world cities. In these pneumatic post networks (they are still in use in some shops and large buildings today), little capsules are propelled by means of air pressure through tubes, reaching a speed of around 35 km/h (25 mph). Paris and Berlin had more than 400 kilometres of extensive citywide networks that were in use until the end of the 20th century – in Prague, the pneumatic system was even operating until 2002 when it was damaged by a flood. Note that pneumatic systems could deliver physical objects, which is hard to do with email or any other automatic technology in use today. Since the 60s several attempts were made to transport goods by pneumatic networks with a much larger diameter (picture below: capsule system in Ontario). Lines were built in the US, the UK, Canada, Russia, Japan and Germany. However, they never became much of a success. Also today, several inventors and companies try to revive the technique. It’s not hard to find out why: due to traffic congestion, a courier in a truck today needs considerably more time to deliver a package than the pneumatic post systems of the 19th century. However, even though the concept clearly works, simply copying the two centuries old technology is not the way forward. Pneumatic driven systems consume quite some energy and they are not suited for longer distances (which are, by the way, also the problems of compressed air cars). Some try to eliminate these drawbacks by designing tubular systems based on an electromagnetic drive, a technique that in the future could be used to reach very high speeds. The most viable techniques, however, adopt just the concept of automated underground transport: they make use of well-known electric propulsion instead of compressed air or electromagnetic forces, and they envision extreme low speeds of 7 to 35 kilometres per hour (4 to 22 mph). In fact, they mix the concept of pneumatic transport with that of an automated subway line or a conveyor belt. Germany, Holland and Belgium are closest to implementing an underground logistic network. That’s no coincidence. In spite of their extensive road networks, these countries face an enormous traffic overload. Three of the top ten ports in the world – Hamburg, Rotterdam and Antwerp – are situated at just a few hundred kilometres away from each other. A massive amount of goods has to be transported from the ports to the hinterland. And things will become much worse, since the ports keep expanding their container handling capacity. In all three countries, road cargo transport is expected at least to double in 2020, which would completely clog the existing (and planned) road infrastructure. In Belgium, the University of Antwerp designed and proposed an underground logistic system that would transport large 40-ft containers from the newly built container dock in the harbour to an existing marshalling yard and a planned inland navigation hub on the other bank of the river. The project, called “Underground Container Mover” would consist of an electric driven conveyor belt of nearly 21 kilometres that would transport 5,500 shipping containers each day (and night). More than 20 computer-controlled perpendicular shafts would drop the containers from the wharf to the underground, 22 to 28 metres below. The slow moving conveyor belt (travelling at a speed of just 7 kilometres per hour) will not even be stopped while loading and unloading the containers. According to the construction firm Denys, who is candidate to build the system, it could be ready in 4 years. In Germany, the Ruhr University of Bochum is working on a rather different concept, called the CargoCap project. The German system is designed for much smaller loads and makes use of unmanned electric vehicles on rails that travel through pipelines with a diameter of only 1.6 metres. Each vehicle, called a ‘Cap’, is designed for the transportation of two European standard pallets. The German system is designed for use on a regional scale (up to 150 kilometres) in a much more finely woven network. Each vehicle is programmed to follow a certain path to its destination. The German system resembles research that was conducted in Holland almost ten years ago. The Dutch then investigated the possibility of an underground logistic network that spanned the whole country. The ambitious plan consisted of a finely-woven network with one hub for every 1,000 to 5,000 homes, which boiled down to a maximum walking distance of 750 meters to pick up goods (the information is not on the internet, data and illustration taken from paper brochure). These concepts offer exciting possibilities. Goods can be transported from factories to stores, from factories to factories or even from stores to consumers - in the long run, the infrastructure could become so intricate that goods can be delivered to individual homes. You could order something on the internet and pick it up through a trapdoor in your cellar the next morning. In the Dutch plan, the city hubs would also offer the possibility to send goods to other cities, which would effectively turn them into a democratized courier service. It might also become possible to send goods from one home to another: email for things. But even without a trapdoor in the cellar the advantages are surprisingly large. Trucks are an important cause of noise and air pollution, they bring about severe traffic accidents, they consume a lot of fuel and they demand a lot of space. An automated, underground transport system erases all these problems. Thanks to the automated control, the low speed and the higher efficiency of the electric drive, the energy consumption of the system is much lower than that of any other form of transport. Moreover, harmful batteries are not needed since the vehicles receive electricity from the rails. "Thanks to the automated control, the low speed and the higher efficiency of the electric drive, the energy consumption of the system is much lower than that of any other form of transport"
The economical advantages are as important as the ecological ones, but less obvious. Firstly, goods can be delivered much faster, in spite of the much lower speed. It’s the constant flow of movement that makes an underground automated system fast. Trucks have to wait at traffic lights and they can get stuck for hours because of traffic jams or weather conditions. The driver also has to sleep, and accidents can happen. Even more important than the higher delivery speed, is the fact that a separate, automated infrastructure makes it possible to predict very accurately when goods will arrive. That makes it possible for companies to lower the amount of warehouses. In fact, in such a system, supply chains become physically connected to each other: the conveyor belts actually leave the factories and connect several production facilities as if they were one large, regional or even global production facility. Last but not least, automated transport is cheaper – not only because of the more reliable delivery of the goods, but also because there are no drivers to pay and because energy use is much lower. 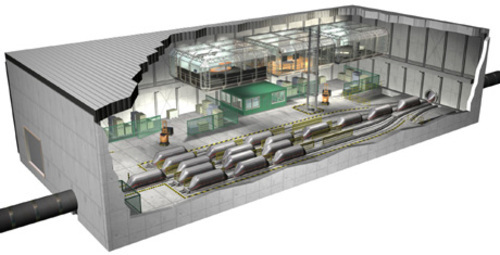 The most important problem of an underground logistics infrastructure is the initial cost. The Dutch calculated that their nationwide network would cost them around 60 billion Euros – and that’s ten years ago. The plan was buried in silence. Nevertheless, the researchers also calculated that an extension of the road infrastructure would cost almost as much. That’s because the maintenance costs (paying the truck drivers, repairing the roads) and the external costs (economical losses due to traffic jams, accidents and pollution-related diseases) are much higher with a road network. But extending the road network has one, important benefit: it concerns the extension of an already existing infrastructure, which means that it immediately yields results. Developing a new (inter)national underground transport system, on the other hand, asks an enormous initial investment and the results are only visible after some decennia. It’s long term thinking versus short term thinking, and humans (especially politicians) invariably prefer the latter. This article was featured on Slashdot, together with a story from Modern Mechanix on Chicago's underground freight tunnel network (which was not an automated system, but nevertheless impressive - more info here). "A world without trucks" was translated in Spanish and in Dutch.